Healthy hearts and fitness depend to a very great extent on what you eat and how much exercise you get. It is important to get the balance right if you are to stay on track for a healthy lifestyle. The most important thing to avoid for a healthy heart is fatty food. Too much fat over the years has been responsible for more people in Britain dying from heart disease than from cancers, strokes and accidents combined. A healthy heart needs a diet that is very varied and well balanced. Convenience foods may save time in the kitchen, but they usually contain much more fat, refined sugar and salt than fresh foods. Fresh food is much better for you and your heart. Our grandparents, who ate a plainer diet, with mostly fresh ingredients, enjoyed less variety in their meals but were less at risk of heart disease and obesity. Cooking methods, too, can help reduce harmful fats. It is better to grill, steam, bake or stew foods than it is to fry them. Fresh, uncooked foods are the healthiest of all. This recipe, based on the Spanish peasant soup, requires no cooking. Bring 150ml water to the boil. Mix it in a bowl with the breadcrumbs, oil and paprika. Put to one side. Dip the tomatoes into hot water for 30 seconds, then cold water for 1 minute, until the skins can be easily removed. Cut the tomatoes in half, remove all the seeds and finely dice the flesh. Trim the spring onions and peel the garlic. Peel the cucumber and finely dice it with the peppers and spring onions. Blend the breadcrumb mixtures, cucumber, peppers, spring onions and garlic in a liquidiser until fairly smooth. Stir in the lime juice. Add this mixture to the tomato juice and diced tomatoes, season to taste and chill. Serve cold.This has a low calorie serving of 145 each. It is cholesterol free and high in vitamin C.
Wipe mushrooms clean with a damp cloth and dry. Remove the stalks and chop finely. Crush the garlic and finely grate the lemon rind. Place both in a bowl with the mushrooms, breadcrumbs, herbs and one-and-a-half tbsp olive oil. Add salt and freshly ground black pepper. Stir well to mix all the ingredients. Brush a shallow ovenproof dish with 2 tsp of oil. 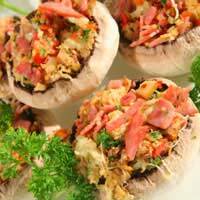 Arrange mushrooms in a single layer and divide the stuffing equally among them. Sprinkle over the remaining oil. Bake in the oven for 15 minutes. Serve hot, garnished with fresh herbs and lemon wedges. Chicken is versatile and an excellent, low calorie source of protein. Originally a Hungarian dish, this recipe is suitable for most meats, particularly chicken, and also with veal or pork. Serve with jacket or mashed potatoes and steamed vegetables. Remove skins from chicken. Heat a little of the skin in a non-stick pan and add chicken. Cook over a medium heat for about 15 minutes until well browned on all sides. Meanwhile peel and roughly chop onions. Remove chicken from the pan, discard the skin. Pour away all but 1 tbsp of fat. Cook the onions in the pan with the paprika and caraway seeds for 3 minutes. Add the mushrooms and cook 2 minutes more. Add tomatoes and stock and bring to the boil. Reduce heat to a simmer then add the chicken. Cover the pan and simmer for 30-35 minutes, until the chicken is tender. Remove the lid. Reduce the liquid to a sauce consistency by fast boiling for 5-10 minutes, stirring frequently. Sprinkle with freshly chopped parsley and serve immediately. This has 185 calories per serving.